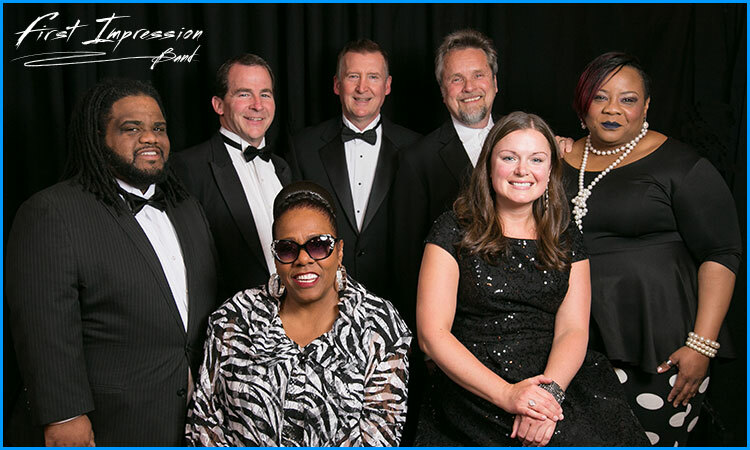 Thank you for considering the First Impression Band in Indianapolis for your very special upcoming event! With twenty years experience providing music for weddings, wedding receptions, and corporate events in Indiana and the Midwest, First Impression has become one of the Midwest's most sought after wedding bands, dance bands, and party bands. Music may be the most important ingredient of your special day, setting just the right tone as your guests arrive, and inspiring them to stay and celebrate until the very end. Our blend of quiet sophistication - popular jazz and pop standards played at conversation level during cocktails and dinner, and our smart, energetic combination of new and old dance favorites - will ensure the music perfectly fits the mood. You have many choices when it comes to music; we believe that First Impression Band in Indianapolis is the best choice. Let us show you why. First Impression is a band of top-flight professional musicians from Indiana who quite simply live and breathe music. Skill, passion, and love of “live” performance bring integrity and sizzle to the wide variety of music First Impression performs. It’s true that, while most bands’ best moments remain on their websites, ours happen night after night, right before your eyes, on the bandstand. We keep the energy and the fun at peak level, so that your guests simply can’t stop dancing (and can’t stop raving for weeks afterward). Our core band includes male and female lead vocals, bass guitar, guitar, drums and keyboards. And while this combination is complete and full-sounding, we can add a horn section and/or additional vocalists, for even more energy and fun. A successful event requires more than great music. It also requires good communication, a shared vision, and low pressure; it requires someone to coordinate the myriad details, from making introductions and announcements, to ensuring that your evening flows properly. In other words, great success requires great service! Our service to you begins with the initial contact. From then until your event’s end, we are at your disposal for quick and thorough consultation. By the time your event comes around, we’ll know your expectations, and you’ll be confident we can meet them. First Impression typically provides a five-hour package. Elegant piano music greets your guests as they arrive for cocktails, and soft jazzy instrumental music serenades them during dinner. Once the formalities end, however, the high energy of our full band will transform your gathering into an electrifying and inspiring celebration! Again, we don’t simply sit back and play great music, we engage with you and your guests to create the maximum fun! We are pros at reading the dance floor. Our sets are spontaneous and determined "on the spot" by the reactions and requests of your guests.